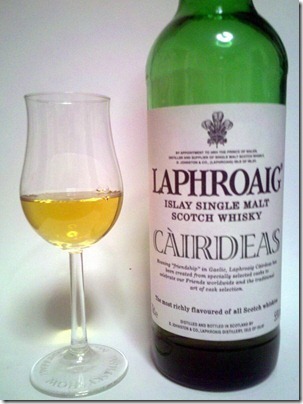 This week sees yet another whisky from Islay, this time from Laphroaig . Next door neighbour to Lagavulin, I tend to find the Laphroaigs on the lighter side of Islay, but without sacrificing that characteristic smokiness. Needless to say, I’m a big fan of them both! 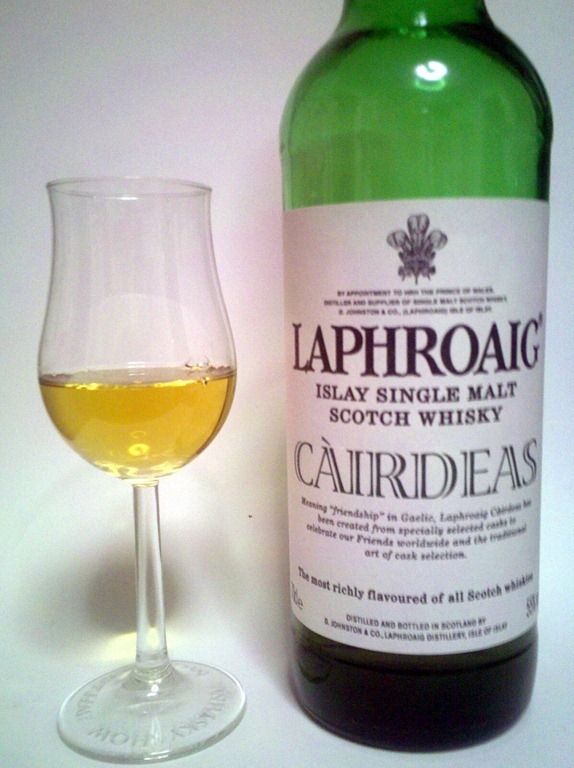 This is the 2008 Cairdeas, a special bottling Friends of Laphroaig bottling – Cairdeas being Gaelic for ‘friendship’ – produced for the Feis Ile, the annual Islay-wide festival. FoL is the best loyalty program I think I’ve ever encountered; not only do you get access to some tempting offers like this whisky but you also get given a square foot of Islay. The distillery will then pay you rent for your land, in the form of an annual dram – the only catch is that you have to collect it in person! The Cairdeas is bottled strong – for 2008, at 55% – which means that you get a serious alcohol hit on the nose. Lurking under that is a distinctly sweet, almost honey like tang and a hint of citrusy lemon peel. Adding a splash of water releases some vanilla tones into the mix too. On tasting, it starts sweet with what I can only describe as a ‘big but light’ smokiness to it. The alcohol is a little overwhelming; with a little water it allows a lot more of the flavour out, the generous smoke on top of the light, sweet notes and a grainy sharpness that lingers but doesn’t overstay it’s welcome. Overall, this is a special whisky that deserves to be savoured but despite that I’d say it’s one of the more approachable Islays. The Islay-heavy tone of this section reflects the current state of my too-small whisky cupboard. I promise I’ll broaden my horizons very soon – I almost have enough room to go shopping again, so any recommendations are greatfully received!